Iraq is located in the Middle East, in southwestern Asia. Iraq is bordered by the Persian Gulf, Iraq and Kuwait to the east, Turkey to the north, Syria and Jordan to the west, and Saudi Arabia to the south. 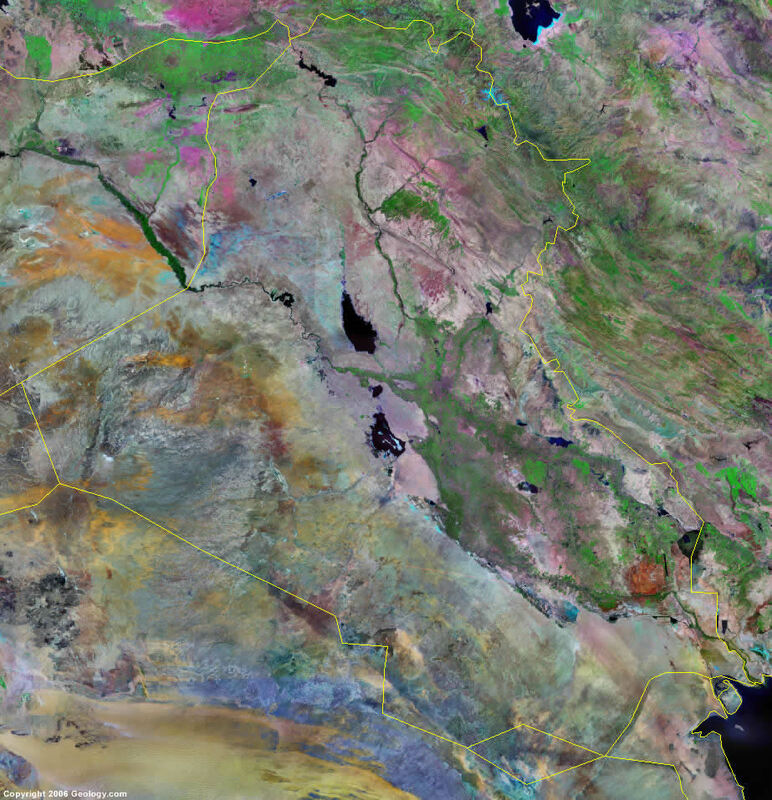 Google Earth is a free program from Google that allows you to explore satellite images showing the cities and landscapes of Iraq and all of Asia in fantastic detail. It works on your desktop computer, tablet, or mobile phone. The images in many areas are detailed enough that you can see houses, vehicles and even people on a city street. Google Earth is free and easy-to-use. Iraq is one of nearly 200 countries illustrated on our Blue Ocean Laminated Map of the World. This map shows a combination of political and physical features. It includes country boundaries, major cities, major mountains in shaded relief, ocean depth in blue color gradient, along with many other features. This is a great map for students, schools, offices and anywhere that a nice map of the world is needed for education, display or decor. 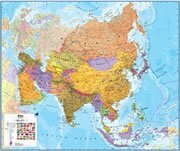 If you are interested in Iraq and the geography of Asia our large laminated map of Asia might be just what you need. It is a large political map of Asia that also shows many of the continent's physical features in color or shaded relief. Major lakes, rivers,cities, roads, country boundaries, coastlines and surrounding islands are all shown on the map. Ad Diwaniyah, Al Amarah, Al 'Ammariyah, Al Basrah (Basra), Al Fallujah, Al Hayy, Al Hillah, Al Kazimiyah, Al Khalis, Al Kumayt, Al Kut, Al Mawsil (Mosul), Al Miqdadiyah, Al Musayyib, Al Qurnah, Al Quwayr, Al 'Uzayr, Ali al Gharbi, An Najaf, An Nasiriyah, Anah, Ar Ramadi, Ar Rifa'i, Ar Rutbah, Arbil, As Samawah, As Sulaymaniyah, Ash Shatrah, Az Zubayr, Baghdad, Balad, Ba'qubah, Chamchamal, Dahuk, Daquq, Halabjah, Hit, Karbala', Karkuk (Kirkuk), Khanaqin, Khurmal, Kifri, Mandali, Qarah, Qawam Al Hamzah, Suq Ash Shuyukh, Tall 'Afar, Tikrit, Tuz Khurmatu and Zakho. Al Furat (Euphrates River), Dijlah (Tigris River), Diyala River, Hawr al Hammar, Hawr as Suwayqiyah, Hawr Dalmaj, Jabal Hamrin Mountains, Persian Gulf, Razzaza Lake, Sahra al Hijarah Desert, Strait al Arab, Syrian Desert, Tharthar Lake, Zab al Kabir and Zab as Saghir. Iraq has vast amounts of fuel resources such as petroleum and natural gas. Other resources include phosphates and sulfur. The natural hazards which occur in Iraq include dust storms, sandstorms and floods. Iraq has numerous environmental issues in all areas. These include pollution to the air and water. Iraq also has inadequate supplies of potable water. Nonetheless, there has been development of the Tigris and Euphrates rivers systems. These government water control projects have drained most of the inhabited marsh areas east of An Nasiriyah by drying up or diverting the feeder streams and rivers. The Marsh Arabs (a once sizable population), who inhabited these areas for thousands of years, have been displaced. In addition, the destruction of this natural habitat poses serious threats to the area's wildlife populations. Other issues include: soil degradation (from salination); erosion; desertification.